Serve this traditional Italian favorite with warm crusty bread and freshly grated Parmesan cheese. Meanwhile, heat 1 Tbsp. of oil in a large skillet over medium high heat. Cook onion, green pepper, red pepper and mushrooms for 5 to 6 minutes, or until tender, stirring occasionally. Remove from skillet. Heat remaining 1 Tbsp. of oil n the same skillet over medium high heat. Brown chicken for 2 to 3 minutes on each side. Stir in Pasta Sauce and vegetables, and bring to a boil. Cover, reduce heat to medium low and simmer for 8 to 10 minutes, or until chicken is cooked through, stirring occasionally. Serve hot with cooked pasta. 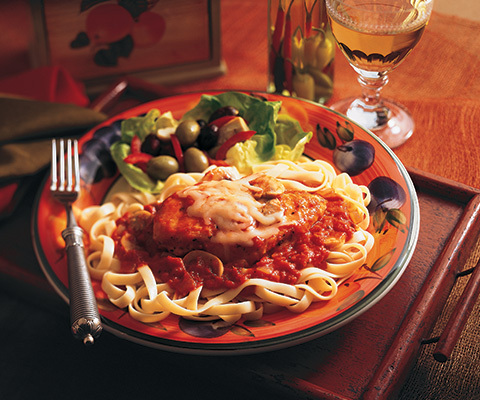 If desired, substitute Classico Traditional Sweet Basil Pasta Sauce with Classico Tomato & Basil Pasta Sauce. My onion is 1 cup maybe. Green pepper is maybe 1 cup. 8 oz mushrooms is one cup. What's up with this recipe? I love this recipe is so easy and my family like it so much I recommend this recipe!! !